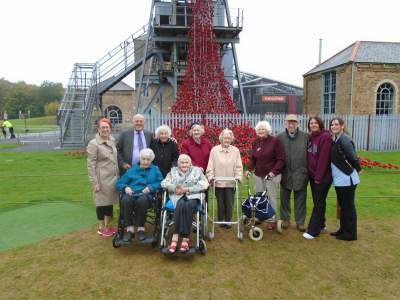 A group of residents from our Castle Farm and Grove houses enjoyed a trip to see the Weeping Window at Woodhorn Museum. The iconic sculpture of red, ceramic poppies which were first seen at the Tower of London last year to mark the centenary since the outbreak of WWI is now on a UK tour. When we heard they were coming to Northumberland we jumped at the chance of taking our residents to see them. By far one of our most popular outings to date, 15 residents signed up to come with us and not even the wet weather could dampen the breath-taking beauty of the sculptures. For some, it provided a chance to remember people they had known who had been involved in the great wars and for others an opportunity to see something first hand that had captivated audiences form around the world. We also went to see the permanent exhibition which depicts life amongst the mining community in Ashington in the mid 20th Century, which evoked lots of memories amongst some of our residents and certainly gave way to some good discussion. Needless to say, we found time to visit the café…… no trip out would be complete without a nice cup of tea! The poppies will be at Woodhorn until the 1st November 2015 before heading off to another location before finally being gifted to the Imperial War Museum.